In 1850, Ballsville, Virginia was a busy cluster of houses, stores, wheelwright shop, railway depot, blacksmith shop, tobacco warehouse, and saloon. 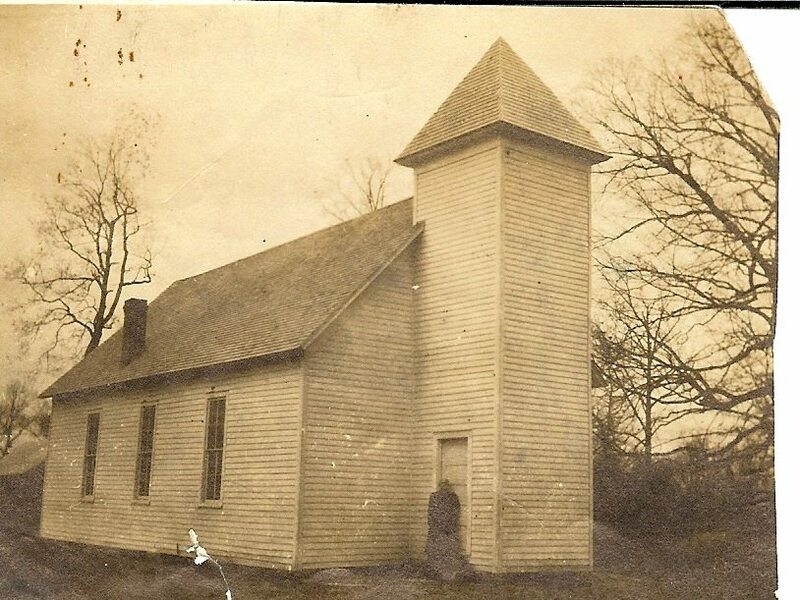 Upon moving his family into one of the farm houses and finding no Baptist church, Mr. Lewis McLaurine and some Baptist neighbors decided to start Sunday School in an old barn on the edge of a field about a mile east of Ballsville on Old Buckingham Road. In May 1850 one acre of land was purchased by Mrs. Louisa Colquit for $15. During the summer of 1850 the men built the small church near the old barn. 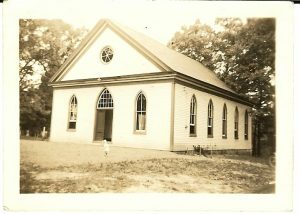 On September 8, 1850, the church was dedicated, the first service was held, and the Reverend S. J. Adkins was called as the pastor. Consisting of fifteen members, the church was named Mount Moriah Baptist Church. Little is known about the next ten years, except that other pastors were Mr. Reynolds, Mr. Crews, and Mr. Gilbert Mason. After the dark days of the War Between the States, the congregation purchased land from the McLaurine family and assisted in the establishment of Mt. Pero Baptist Church, 1873-74. John Bagby, a former Confederate Chaplain, was called by Mount Moriah to serve as pastor. Dr. Bagby and his wife Pattie served Mt. Moriah, and 3 other churches, for 47 years (1866-1913). During his ministry five young men of the church were called into the ministry – Eddie Whitlock, George William Hurt, Werter Wallace Hurt, William Edward Hurt, and John Jeter Hurt. In October 1883, an additional acre was bought for the sum of $17.25. The small church was now overflowing during services. The building was moved to one side, and a new building erected. This is the auditorium of the present facilities. Sunday School classes were added to the back of the auditorium in the 1950’s. The Fellowship Hall was added in 1970 and an additional Sunday School wing was built in 1990-91. The congregation was able to purchase an additional 10.4 acres January 1993 for $25,000. Mt. Moriah continued to have circuit riding pastors – Abram, Mintz, Taylor, Mitchell, Hoffman, Pierce, Smith, T.P. Reynolds, L. C. Vimpeny, and T. A. Powell – until May 1971 when Pastor Glenn Pace came to the church as interim pastor. For most of these years, the pastor would preach at Mt. Moriah on the second Sunday of the month. Sunday School would be conducted by the congregation every Sunday. In October of 1971, the church called Pastor Pace as its first full-time pastor. On October 13, 1971, due to liberalism in the Southern Baptist Convention, Mt. Moriah voted to withdraw fellowship from the Convention and become an Independent Baptist Church. After 20 years of faithful and fruitful service, Pastor Pace’s health required him to resign in January 1991. Pastors Mark Gende (1991-1994) and Joe Curruthers (1995-2002) followed Pastor Pace. The church family is extremely thankful for Rev. Ken Marken who has served as interim pastor on two separate occasions between full-time pastors. His love and wisdom have helped to give stability and direction during times of transition. In July 2003 the Lord brought our current pastor, Thomas B. Alvis, Jr., to serve as our under-shepherd. Throughout the church records family names of White, McLaurine, Hurt, Heath, Coleman, Whitlock, Martin, Hardy, Walton, and Braudrick appear regularly as leaders within the congregation. While every church experiences "ups and downs", the long history of Mount Moriah Baptist reveals a continued commitment to the Word of God and a steadfast philosophy of ministry that seeks to glorify Him. Baptist Training Union, Women’s Missionary Society, Sunbeams, Bible Memory Association, Pro-Teens, AWANA Youth Groups, Mount Moriah Christian Academy, Vacation Bible School, and Master Clubs are just a few of the ministry opportunities that have existed over the years. Souls have been saved, believers baptized, saints equipped and edified, families strengthened, missionaries supported, young people trained, and the cause of Christ furthered. To God be the glory, great things, He hath done! Special thanks to Phoebe Hurt and Billie Jane Nichols Lester for their efforts in the compilation of this history.